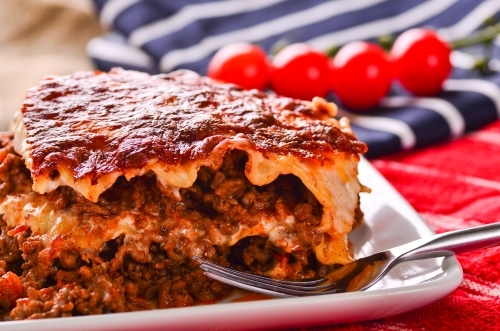 Beefy This classic Beef Lasagna recipe will keep you busy for a while. It takes a little time to make but it’s well worth the effort. Using Barilla’s no-cook lasagna noodles cuts down on the time a little. Though I do boil them for a minute or two before using. The best thing about these noodles is that they are nice and thin. Not like you regular thicker type lasagna noodles. There are many ways to make Beef Lasagna. Some recipes call for a combination of beef and ricotta but this recipe uses all beef. The beef is fortified with red wine and herbs while the taste of the melted cheese pulls everything together. For this Beef Lasagna recipe I use a 9 x 15 glass baking dish. It should feed 8 people if serving seconds. For a dinner party I would double this recipe and of course use a larger pan. Enjoy! Place the dry lasagna inside the baking dish to determine how many sheets you’ll need then just times that by four. In around 4 quarts of boiling salted water, cook the noodles for 1 to 2 minutes until slightly limp. I do this because the last time I used no-cooking noodles the edges were crisp and not cooked thoroughly. Drain and set aside and sprinkle a little olive oil on top to keep them from sticking together. In a large frying pan, saute the onions, bell pepper, carrot, celery, mushrooms and garlic in the olive oil and butter for 3 to 4 minutes. Add the ground beef and break up the meat into pieces. Stir everything together and brown the beef for about 5 minutes more. Stir in the tomato paste and cook for 2 more minutes. Stir in the wine and cook for another minute or so. Add the tomato sauce, diced tomatoes, parsley basil , oregano, salt and pepper. Cover and cook everything on low heat for about 30 to 40 minutes stirring on occasion. To assemble, coat the baking dish with a little olive oil. Start with a layer of noodles then spread a thin layer of the ground beef over the top. Sprinkle the beef with the Romano cheese and top with 6 pieces of provolone and 1/3 of the shredded mozzarella. Add another layer of noodles, beef, Romano, provolone and mozzarella. Add another layer of noodles and repeat the step above. Bake in the oven uncovered for 30 to 40 minutes until the cheese is brown and bubbly.